Well finally I've got connecting to hotspots using iPass on OSX working. We have a corporate account with iPass, and I installed the software. After much much trial and error, I got some settings that work. Hurray! Now I can use the Internet while mobile and it doesn't cost as much as 3G, especially abroad. Whe you install the sofware put in your credentials as shown, or, if you get it wrong or need to check something, you can see them from System Preferences. so use those bits as your credentials. Sample screenshot above. 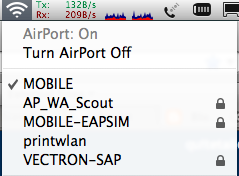 Now, click on the fan symbol on the menu bar, and select a hotspot. In the example below I use MOBILE which is Swisscom. What should happen is that the iPass client should kick on and log you on. Sometimes this doesn't happen, so if it doesn't, go back to the airport fan, turn airport off, count to ten, and turn back on again. UPDATE: Sometimes iPass doesn't connect at all and just seems to go to sleep. If this happens, you may need to quit the iPass application, and relaunch it. It doesn't have a 'quit' button, so what you can do is use Activity Monitor, click on iPass and press 'Quit Process'. Then go to System Preferences, click on iPassConnect and it should re-launch. Thank you for your post--we are pleased that you are enjoying the service. To keep up on the latest offerings at iPass, you can also follow us on Facebook or Twitter too! Thanks iPass team... please note my UPDATE about how iPass goes to sleep / fails to connect. Thank you for reporting this issue. 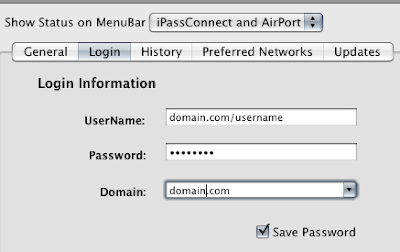 Just to make certain I understand your configuration: are you configured to show both the native AirPort and iPass icons in your menu bar (as your screenshot shows)? If so, then you would need to select the iPass icon to initiate an iPass login. If configured for "iPassConnect Only" , then you would follow the procedure you outlined. We have not previously heard this reported so if this is what you are doing, then we are very interesting in troubleshooting and investigating this with you. Thanks again for reporting it. BTW - Most users (but not all) will NOT need to prepend their domain name to their username (as in your example) - it depends upon how our customer's choose to authenticate their users for iPass usage. Always good to check with your sysadmin if you aren't sure. But great job of figuring out that ~you~ needed it! Thanks again for reporting this and thanks for helping out other iPassConnect for Mac users with your blog! All I can say is that these were the settings that worked. If I get chance I'll go to another hotspot and try without the domain pre-pended.